After upgrading to vCenter 5.5 and ESXi 5.5 in my environment, I needed to upgrade my VMware Tools. Which generally isn’t a big deal. Usually just click and auto install (without a reboot, which is awesome) and move onto the next one. This morning I cam across a syslog server that I’m using for my ESXi logs that is running Ubuntu Server. When I tried the automatic upgrade I got an error and was forced to mount the CD and do a interactive installation, which still isn’t a big deal. I went ahead and followed VMware’s instructions outlined here. Once I got to the point of running: “sudo ./vmware-install.pl -d” it failed wit this error. Therefore, I went looking for vmware-uninstall-tools and found nothing. I decided I would do a search to find out if the file even existed, and I found it in the installation folder from mounting the drive. I then ran the .pl from the location and got positive results. 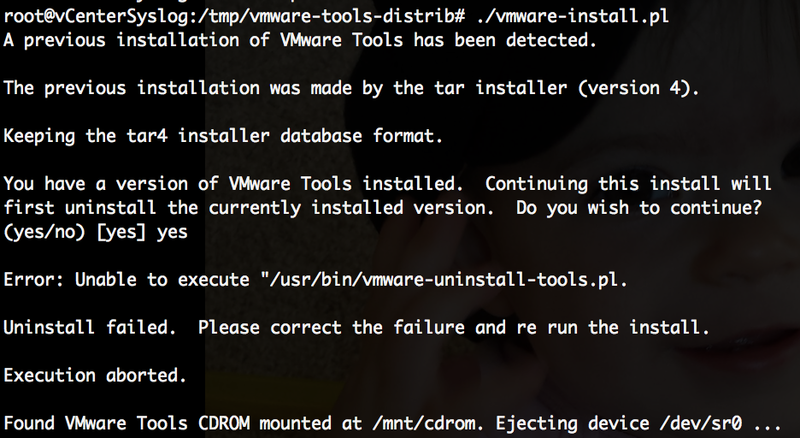 After that I finished following the instructions on updating VMware tools and ran “./vmware-install.pl -d” and it worked.